I was completely engrossed by this novel from the start. Set in Venice you can't help but be smitten with the setting. The canals, the palazzos and the tiny laneways led to a visual immediately and I was drawn into the story by the setting alone. I soon discovered though that I was also captivated by the plot. Though my knowledge of Vivaldi is decidedly lacking it didn't deter my reading with pleasure. The story of Adriana is the main focus and her relationship with Vivaldi leads us into a complex social history of the period. Feisty and determined, Adriana is the perfect heroine for any novel. She's stuck doing what her unkind father wants and his attitude towards her is depressing at best. Despite their friction she seems to have raised herself to be exactly what he was hoping to avoid. In an era when daughters were raised to obey you wonder where her independent streak came from? Her late mother perhaps? 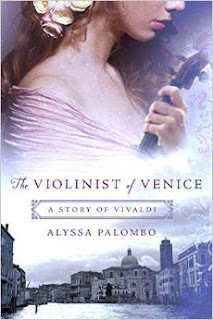 Having forged the attachment to Vivaldi we are led through her trials as she tries to hide her rebellion from her oppressive family and navigate other relationships. The novel has numerous twists and turns and though I've no idea if any of it is based on tidbits of fact I'm quite sure that the possibility of such a liaison could indeed have been possible during the period. Thank you to Griffin Books for our review copy. All opinions are our own. Music and a love story mix very well.